Treat your pal to the meaty flavor he craves with the Merrick 'Lil Plates Small Salmon Recipe Grain-Free Dog Treats. These protein-rich treats are made with salmon for the hearty flavor your pal will love. 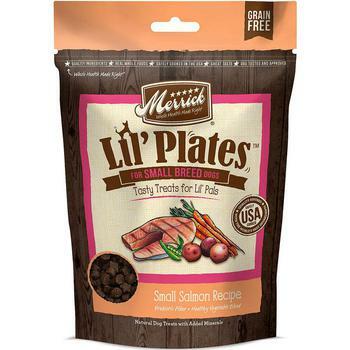 Lil dogs will be sitting and staying for joy with new Merrick Lil Plates treats made just for them. These grain-free, gluten-free treats are big on flavor and protein, but small in size for their tiny mouths.